My name is Liz Jones, and I am the co-founder of St Clare’s 10k race which is held in April each year. Unfortunately, paper records are poor from the early days. So,we have to rely on memories from 25 years ago! I hope that those who took part in early years, and those who volunteered to help in so many ways, will be able to contribute further memories. I had been a supporter and volunteer for St Clare almost from the beginning of the Hospice’s start in the early 1990s. I was given a leaflet about the new venture and, as I had a little time on my hands, I went along to meet the team, which was, at that time, based in a couple of rooms in part of the community centre in the north east of Harlow. There, I met Jo Brennan, the Manager, Beryl Cruikshank, the administrator, Stan Hopkins, who was gathering volunteers, and Janet, who ran the twice weekly Day Care. I was inspired by the enthusiasm of this tiny band. They had taken on the huge task of supplying local care for patients and their families. My family and I were drawn into this project, which very quickly grew in the scope of its work and in numbers of volunteers and staff. Funds were always urgently needed. Our son, Matthew, did his bit by riding as far as Manchester and back without leaving Epping! That was by riding a road bike on a turbo trainer in the High Street for 12 hours! This raised lots of awareness for the new hospice as well as £2,000 in sponsorship; and, inspired by Jo Brennan’s enthusiasm in particular, we thought about what else we could do. At that time, Matthew was a member of Epping Triathlon Club. He was spending a lot of time cycling as well as running. Matthew got to know the area around where the Hospice had moved to – a house called Stone Barton in large grounds in Hastingwood. He decided that a route for a five mile run could be planned, using the drive in front of the house as a start and finish. The idea was greeted enthusiastically by Jo and her team, and so the first St Clare Fun Run was born! Using the models of the many runs which Matthew and his fellow runners in the Tri Club and Harlow Running Club took part in, we set to work producing maps, kilometre signs, running numbers and sponsor forms. We also coerced friends to be marshals on the course, organised water stations, persuaded local sports shops to give us prizes, filled goodie bags with items scrounged from supermarkets, made sure we had first aid support onsite and informed the council and local police. As I remember it, we had to persuade the council of the virtue of the project, but the police, once we had driven two constables round the course, were amenable, though not very interested in appearing on the day – in contrast to how they monitor the route now. So many people came to our aid and agreed to give up a Sunday morning for this new venture; to marshal the runners on the course, give out water bottles, provide medical support, be timekeepers, write down the results, provide refreshments and give out prizes at the end of the race. But one of our friends said that they didn’t want to help – they wanted to do it! But they were not runners, so they said that they would walk the route, some with dogs! And for several years after that, walkers joined the runners on the same route – and indeed the money raised by walkers soon far outstripped that of the runners. This was further enhanced by sponsorship from local employers who encouraged their staff to take part. However, as numbers grew so considerably, it became necessary to find a route across the fields for walkers, as they had become a hazard to the speeding runners! Eventually, of course, the walk became an event in its own right and on a different date, attracting even more people and much more sponsorship. And so, Winter Walkies was also born! Younger people will be astonished that, even though this was only 25 years ago, mobile phone ownership was not all that general; we had to borrow a few for some of the marshals who didn’t own them, in order to ensure that everyone could be in touch with Stone Barton if there was an emergency. Another vast contrast is the way in which we then publicised the event. The internet was still in its comparative infancy, so there were no opportunities to email press releases. No Facebook and Twitter with which to spread the call for competitors! Instead, press releases were sent by post or delivered to local paper offices, and running clubs secretaries were sent letters. Luckily, there were already Friends of St Clare groups in Epping and Harlow. These were very helpful in spreading the word, as were the new Hospice shops. Our first St Clare Fun Run in 1994 was not without its crises! The route that year was different to the one which has always subsequently been used. From Stone Barton it went down Hastingwood Road and into Mill Street. It went left along Harlow Common, down to the A414, and round part of Potter Street. Then. retracing steps along the Common and back to Stone Barton. In the following years, we avoided the possible traffic hazards of that route. The timekeepers had difficulties clocking the runners in at the finish, and the results all had to be analysed by hand, and then written up on sheet and pinned to the wall. This took a long time, and there was some muttering among the runners who, understandably, just wanted to get home and have a shower! However, eventually the task was completed and we were able to announce the winners in the different categories – juniors, ladies, senior men etc – and then give out the prizes, which were donated sports clothing, from socks to fleeces! Luckily, in following years we were able to have the services of Rowan Buoy and his team who still produce computerised results for this event. And in subsequent years, we asked Wendy Partridge, a wife of a Tri-Club member, to give us her great experience of sporting events and act as Timekeeper. A valuable outcome of the early years was the participation of local runners and their clubs and the subsequent raising of awareness of the Hospice amongst a new section of the community – the young and fit. Every year more and more runners joined in the race. With this expert participation came the need to measure the course. My husband Phil walked it every year with a measuring wheel, to ensure that the club runners – many of them using this event as final training run before the London Marathon – would be able to record their times exactly over the distance. The season for the run was even changed for this reason; the original was held in September, but this was changed to late March/early April. Although this sometimes brought worse weather conditions! I remember that one year early on, probably over 200 runners had to shelter in the house. There was torrential rain before the race! This was before the extensions were built. And all concerned had to use the two or three toilets available in the house – that was quite a queue! The race also attracted people who had never run before. Many came to run for the fun of it and many came for other reasons. 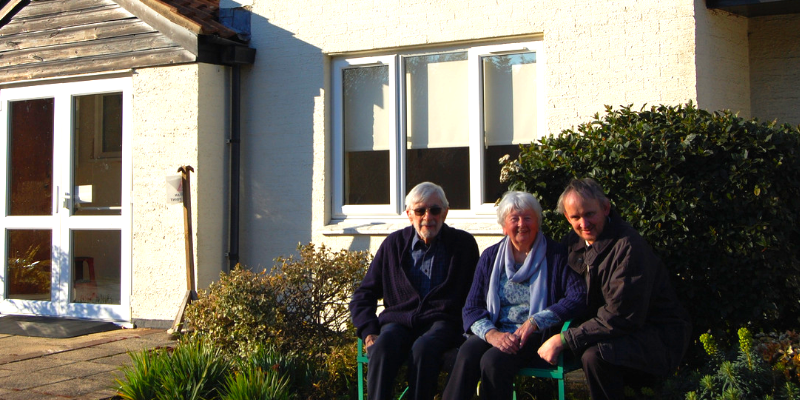 As the Hospice grew more, local people had a personal knowledge of its work. These runners have always been the real heroes for me. For many, it becomes a struggle by the time they are half way round the course. Yet, they are so determined to raise money through sponsorship for the Hospice, they keep going. From these early days, I’m happy to say that the event has grown into a huge occasion. One in which both club runners and fun runners participate in great numbers. And, thankfully, with plenty of Portaloos! But it has grown from very small beginnings. I have the undated accounts for the event, compiled by my neighbour Liz Halstead. She was Treasurer of the Epping Friends Group at the time (1995-6). This shows that 109 people entered. Their fees, plus donations, raffle proceeds, and refreshments raised over £590 on the day. Seven runners obtained sponsorship and donations, adding a further £372. Our expenses for the specially printed tee shirts and other necessities came to £378. Luckily this expense was covered that year because we had obtained the sponsorship of a local Hastingwood business, LTE! The Managing Director was the father of the Hospice’s fundraiser at the time! That year was the first in which we gave each competitor a specially printed t-shirt. It had the sponsor’s logo on the sleeve, and the old Hospice logo of the outstretched hand of St Clare’s on the back. It has our race slogan on the front: Best Feet Forward. There were also other memorabilia given out over the years. A large coaster with the logo and race message, and in 1999 a travel purse. There was also one year a note pad in a St Clare cover. It was all designed to keep the Hospice in people’s minds throughout the year. I wonder how many people have still got them. The popularity of the event mushroomed; in contrast to the figures for the second or third event. I have a letter which shows that just a year later in 1997 entries were doubled.£3600 was raised – what a difference! And there are many other bonuses as well as numbers and income. Some of the runners started to run for the Hospice in the London Marathon. Either on their own initiative or in a team using the Gold Bond scheme. They raised large amounts for St Clare. And the race has become far more inclusive. For the past few years it has been great to see the wheelchair entrants speeding along the lanes. They follow the example of the first Paralympian who took part in our event, Noel Thatcher. He is a partially sighted runner who won the St Clare event overall in 2002. His time was 32 minutes and 23 seconds! For ten years now the organisation of the race has been shared between the Hospice staff and members of Harlow Running Club, who now have the task which my husband remembers well – getting up very early to set up the course with kilometre signs and warnings of approaching runners! Many Hospice volunteers also help, with marshalling and all the other tasks. There is a lot to do with a large event, as they always has been. The event always marks the beginning of spring for me, as the route which my son devised in 1995 is still the same today; there are daffodils in the hedgerows and gardens, new leaves on the trees, and the sound of birds singing, the swish of the wheels of the lead biker and the amazingly fast and light wheelchairs, followed by the thud of hundreds of running shoes and trainers on the roadway!